A loop is used for executing a block of statements repeatedly until a given condition returns false. In the previous tutorial we learned for loop. 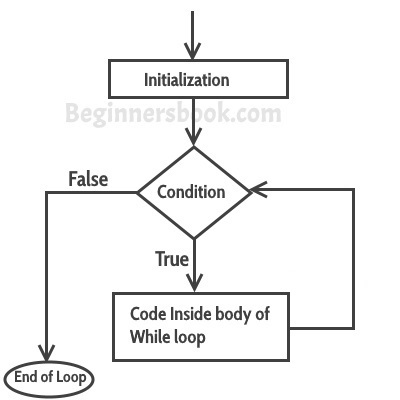 In this guide we will learn while loop in C.
step1: The variable count is initialized with value 1 and then it has been tested for the condition. step2: If the condition returns true then the statements inside the body of while loop are executed else control comes out of the loop. step3: The value of count is incremented using ++ operator then it has been tested again for the loop condition. The program is an example of infinite while loop. Since the value of the variable var is same (there is no ++ or – operator used on this variable, inside the body of loop) the condition var<=2 will be true forever and the loop would never terminate. Infinite loop: var will always have value >=5 so the loop would never end. Infinite loop: var value will keep decreasing because of –- operator, hence it will always be <= 10. -using AND(&&) operator, which means both the conditions should be true. – OR(||) operator, this loop will run until both conditions return false. – Here we are using two logical operators NOT (!) and AND(&&). In this example we are testing multiple conditions using logical operator inside while loop. How any language is created? Is it created in Low level language like Machine Language (Binary or OS,DOS) or SOMETHING else????????? if statement is use to define condition , if condition holds true the statement will be executed otherwise not. printing numbers form 1 to 10. Can we use while continue break and for in one program can you give an example? your explanation is terrific . I am sure that any beginner will definitely learn easily from your website.